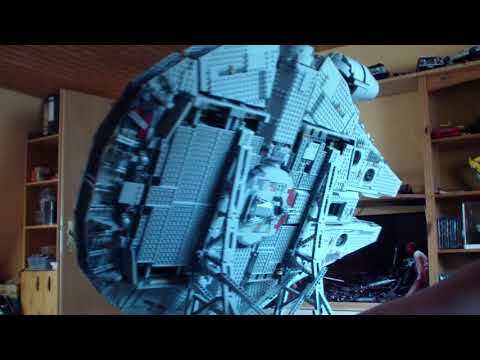 So, my UCS Falcon is on it's way (supposed to be arriving on Wednesday this week) and I've started thinking of how & where to display it. I have a built-in shelf that is big enough, but because of the elevation (it's essentially at eye level) I am trying to think of a way to give the display some angularity. Looking at Huw's photos, I'm thinking about using some 8x8 plates and adding hinges so that I can adjust the angle of the lift under each landing gear to get an overall tilt of something in the 10 degree / 15 degree range. Anyone else started on display ideas or plans yet? 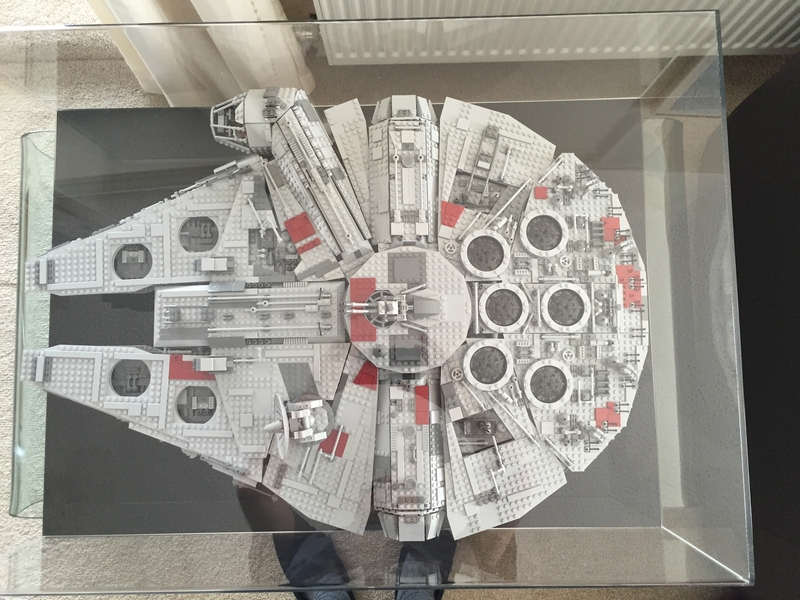 I am going to go the coffee table display route, just need to find the right table and figure the best way to encapsulate the Falcon in glass. Posted the picture above on another thread, not a great photo unfortunately. I have a 7778 Midi MF in the bottom left corner now. I have an unopened microfighter MF and have been meaning to add it in the other corner but may wait until the rumoured new MF microfighter is released or add both. Note: This is a bricklinked 10179 with usual substitutions so will be replaced with 75192 once I have built it over Christmas break. 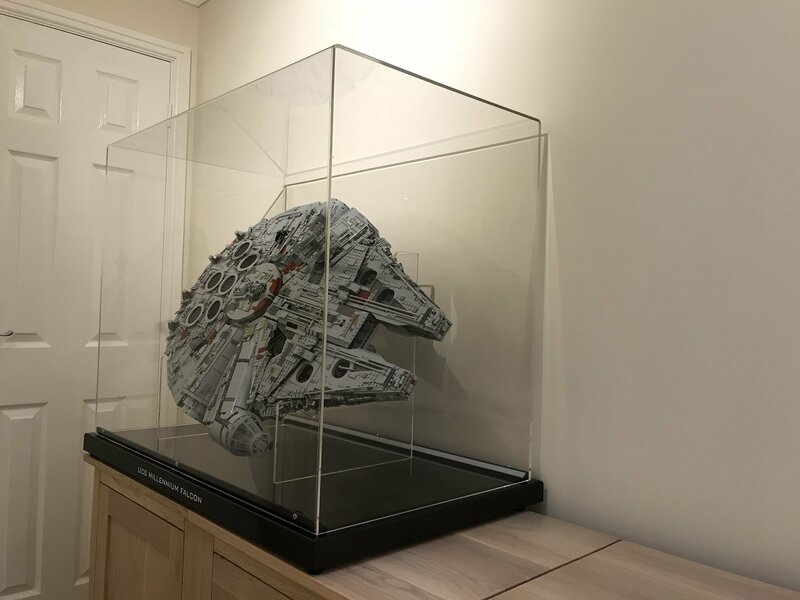 Is there any US based option for that display case? I'm not feeling the shipping cost. The one I posted is a custom one off case, 5mm acrylic with 10 mm base. I got it here: http://www.widdowsonsltd.co.uk/ you should be able to find a company doing similar more local to you. I breathed a sigh of relief when I saw that the new version is basically the same size. I plan on making something similar to this when I get mine built (once I get one that is), eventually anyway. 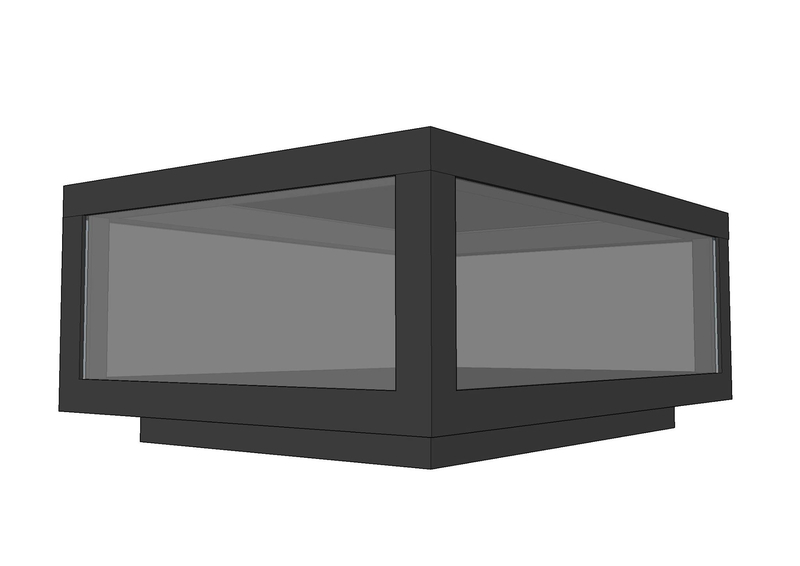 To help the cost I'll probably just use plexiglas for the sides and only do glass for the top. How tall is the set if you take off the undercarriage? Wondering if I can fit it into my coffee table. I modified it slightly so I can swap out anything that fits into the rectangular space as long as it's no deeper than 20cm. ^ does it not run? 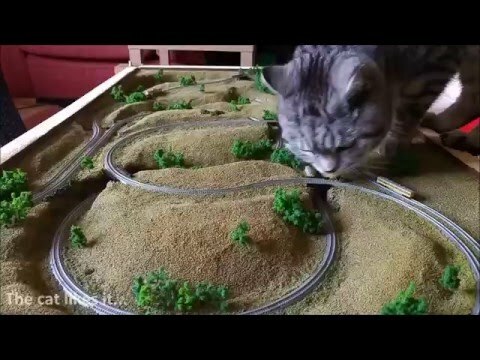 Not when the cat's on it! It runs any standard T-gauge rolling stock. 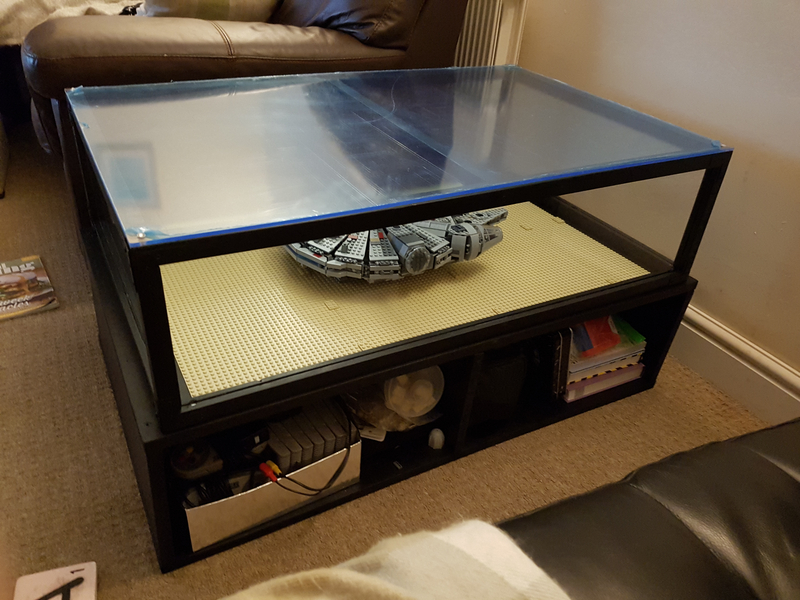 I have something like this planned, the wooden frame and acrylic sides will be cheap enough it will just involve a alot of labour. 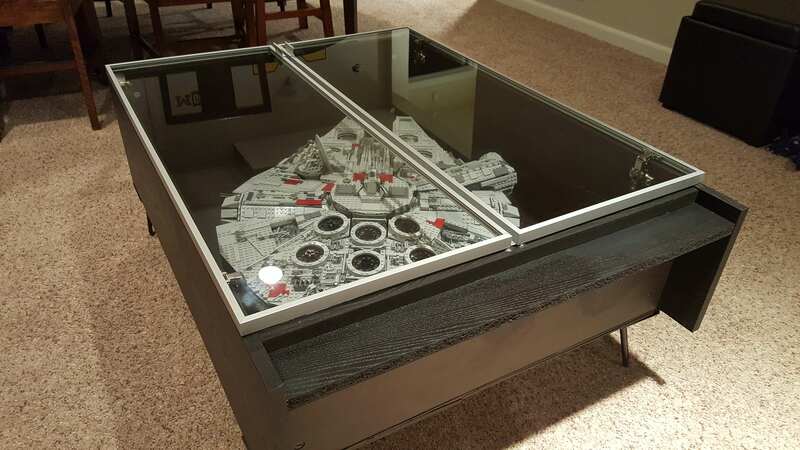 However I am struggling to find a glass top at a reasonable price given its a custom size. Check out your local $upplier of custom $hower door$. I've had mine planned for a little while now - thought I would post what I have here. Just waiting for the Falcon to arrive now. 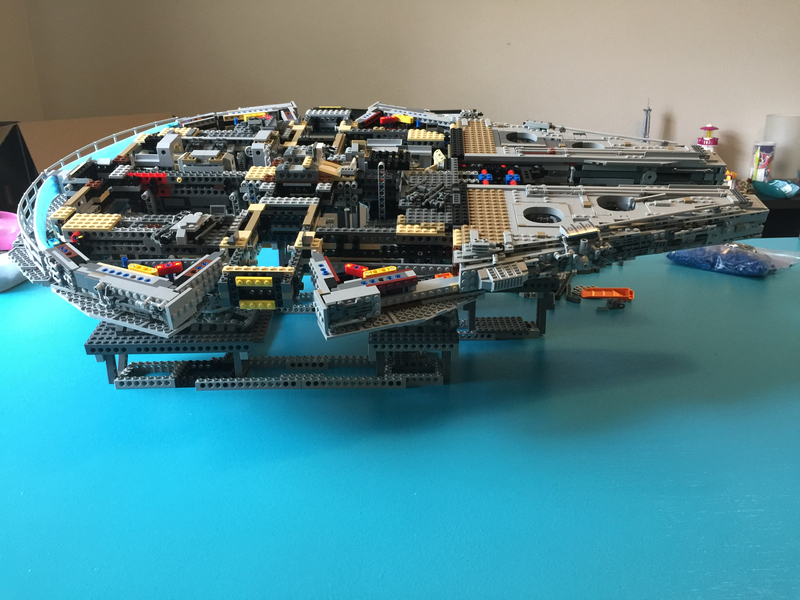 Just got the TFA Falcon in for now. 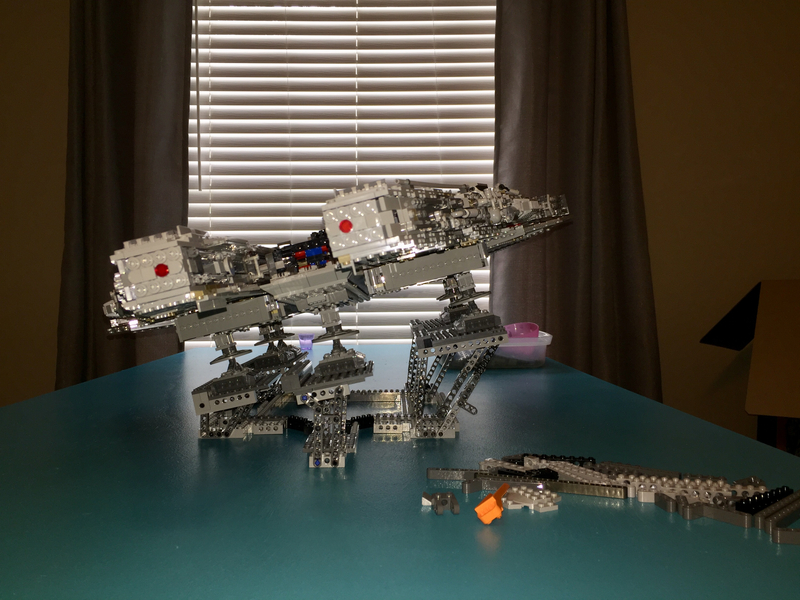 Currently building a sand base for it to sit on also. Built the base from some standard MDF, then some pine for the display frame with some grooves cut in for the perspex. Happy to post some more in-progress shots if people want to see. 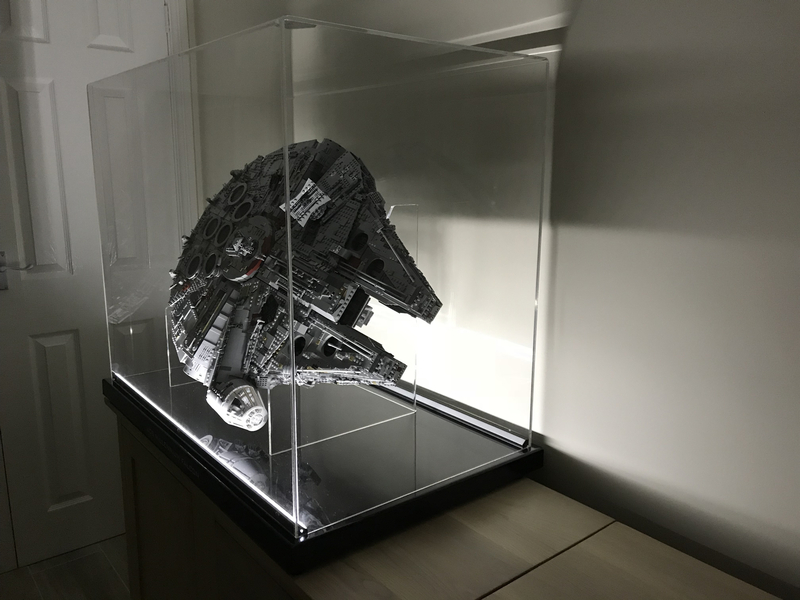 I've been looking for a display solution for a while, after my wife gave me the look when I suggested displaying this in the living room. This looks ideal and I plan to make this once I've finished building. @paul_merton I love that! Beautifully done. That stand/video is by efferman over at eurobricks. Still not sure where mine is going to live. Look out for my review of the PureDisplay case, http://www.puredisplay.com/pureshop/pc/viewPrd.asp?idproduct=6109&idcategory=143, in the next few days. I looked at this one as well, my only issue is from this angle. It just looks terrible and screams "this is a shelf laid down". I couldn't pass it through my oversight committee (wife). Looking for something similar, only without a pronounced bottom. 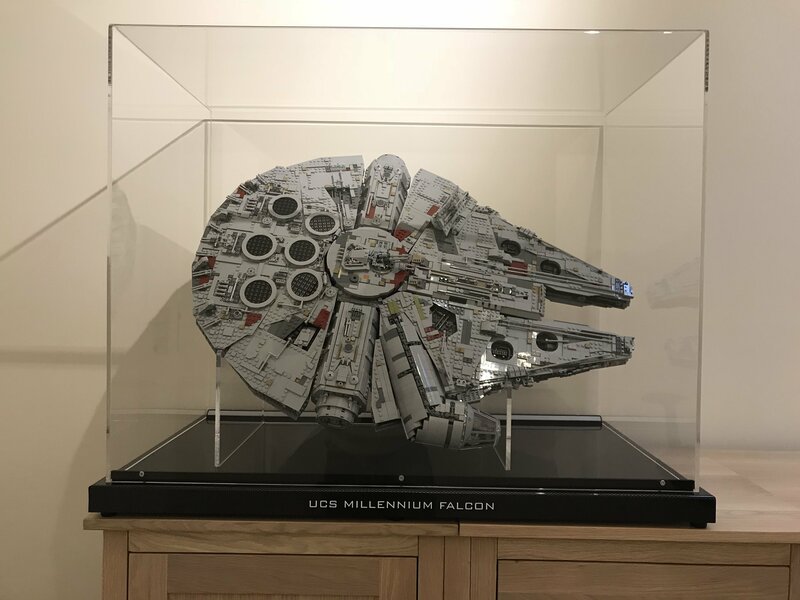 I'm yet to see anything at IKEA that provides close to a dust-tight seal and am willing to bet London to a brick that after a while there will be a strange line of goop across the top of the Falcon and the first time something is spilt on that 'tabletop' things are going to end badly. Although I must thank @Hanzo for his comment about a 'pronounced bottom'. Yes, I can be fairly childish in my sense of humour. At my house, we have a shower door that has a plastic flap, part of the design to seal off water getting out. This very same style flap could be used for keeping dust, other materials out of the book case. I do see the point, though, of this being a cheap looking alternative to something actually design for the correct purpose. The room my Falcon is going to be displayed in has a linoleum floor and low foot traffic. Dust really is a small factor in that area. But, I'm still going to look for a way to display it, dust free and visible from several angles. Not to mention the fact that it looks like those glass doors are sloping inwards. Might be the camera angle, but that would send my OCD into overdrive. Does anyone know if the height listed for the new falcon is accounting for the satellite dish? Trying to work on my dimensions before I start building this table. I measured it the other day at approx 23cm with the round dish. This is my custom display.. I’m extremely chuffed with it! 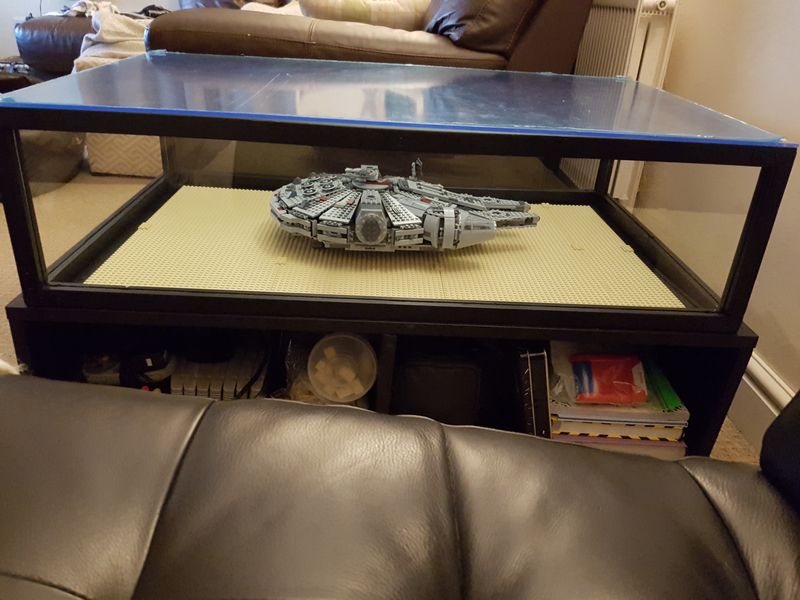 I bought an Ikea coffee table, big enough to fit the Lego Falcon and the 2010 Hasbro version. As far as keeping dust off, I'll be doing that manually for a while. I have some ideas for a plexi display case, but can't find the time to work on it right now. Which table out of curiosity? The one I picked out is black. the angle this is at is about the maximum you can get for a built model, and not glued. As the weight needs to be on the technic main structure.. I went for a carbon fibre effect base as well, which looks good in the daytime, and when lit up looks mirrored. Also the LED lights can be front and back, or just front. With both front and back its a bit much.. and with just front on it looks like the MF is flying past the planet. 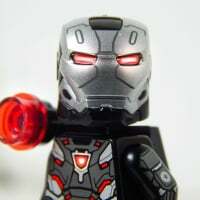 Sorry if I missed it earlier in the thread, but did you make his yourself or buy it somewhere? If you bought it, where and how much, it looks perfect to me. @Fireheart - really like that display - and the writing on the base in that font (is font the right word, I'm wondering if typeface is more apt) looks really authentic. Those display lights are very subtle as well - although I wonder if they were slightly less bright and could hit the top of the Falcon more it might show off the detail a bit better in low light conditions? I know it depends on how and where you want to display it of course! I second omnium's questions about where you got it from (or the parts for it)? I didn’t make it, it was a custom build. 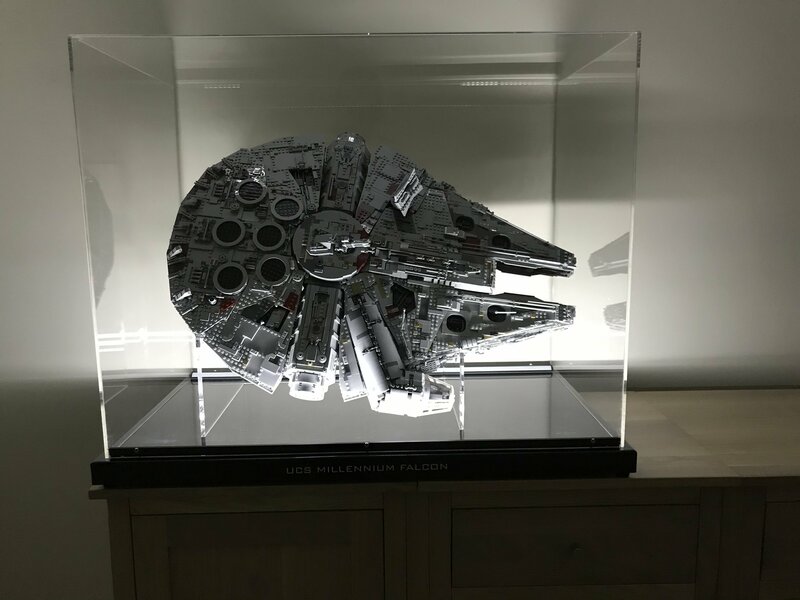 I spent quite a bit of time speaking to professional display manufactures asking if they can do a custom build, and explained what I wanted. The answer kept coming back, no sorry. 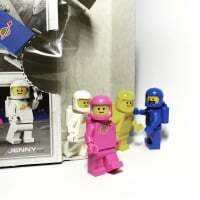 Then I spoke to a company called luminati in Devon, and explained what I wanted, sent images from the side of the MF box of the dimensions, and images of the Lego store display to explain the angle I would like. I wanted two options, desk mounted, and wall mounted. Which they gave. But I’m glad I went for the desk mounted option, more expensive but it would not look right on the wall given it needs 500mm depth. The text font, colour, and size was chosen after quite a bit of time experimenting online with a font generator. The chosen is: BankGothic LtBT, and 10mm height. You then get the artwork to sign off, and a 4 week wait..
As for cost; if you budget for 3 x RRP 75192, then you might have enough left over for a nice bottle of vino and a meal at a local restaurant, with the other half to explain what you have just ordered.. Thanks @Fireheart - that's a ton of great info and I admire your dedication to getting it looking just right. I agree that a wall mount is a compromise which is better to avoid if you can. A custom built case costing that much though - wow. Well done! Hope your SO enjoyed the meal and wine! Though, I wonder if they'd make another cheaper now that they have the plans, i.e., after you've paid for the expensive development work. I knew roughly what the price will be, enclosed Perspex cases (i.e. no screws holding the seperate sheets together) are expensive, especially when you have one of the height this one is. Would love any feedback or suggestions, I don't quite have the spacing exact, but this is what was in my head. I would try to connect the higher supports to the lower ones. Failing that, I'd try to move the higher supports outwards by at least two studs, and also try to move the lower supports at least one stud inwards. The higher supports look like they're taking a lot of strain - mainly because both of them are leaning to one side. They'll probably hold the full weight, but I'd personally want to be rather more sure than probably. @Habitant99 I would complete the build first, as the weight of the model increases quite a bit from the stage your at. You will see what the designer means by “this is pushing what they can do to the limits”, when you pick up the model once complete from underneath. Check that the landing gear can cope with holding that weight at that angle. It might be wise to see if you can also hide some support around the technic base area which can hold the weight. My display holds the weight around the Technic area, and I still have the landing gear on. I can post images of this if it helps. Definitely. I was having a hard time measuring the stud distances, but with the pictures I plan to adjust them. 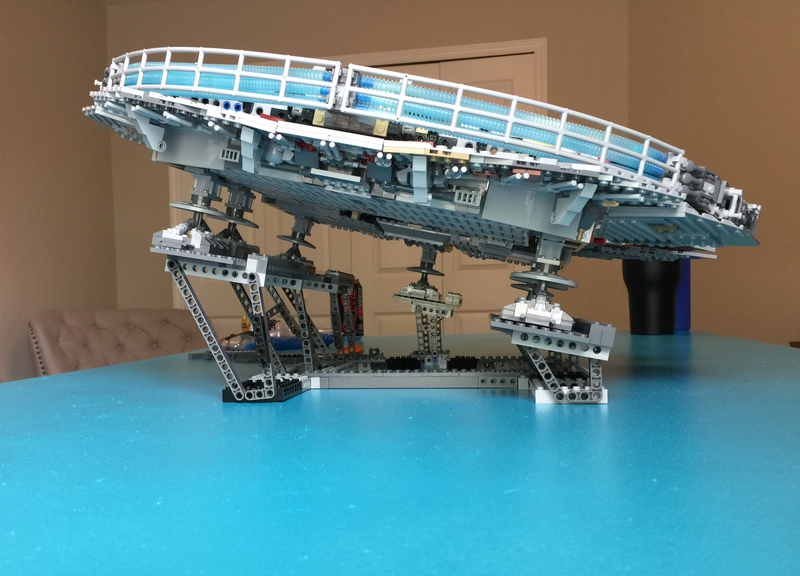 The other thing that's hard to discern from the photo is that the higher platforms are not contructed with the same elements as I was short two adequately sized beams, so I'm going to be bricklinking them before I finalize anything. True, I'm only about 60% of the way through. 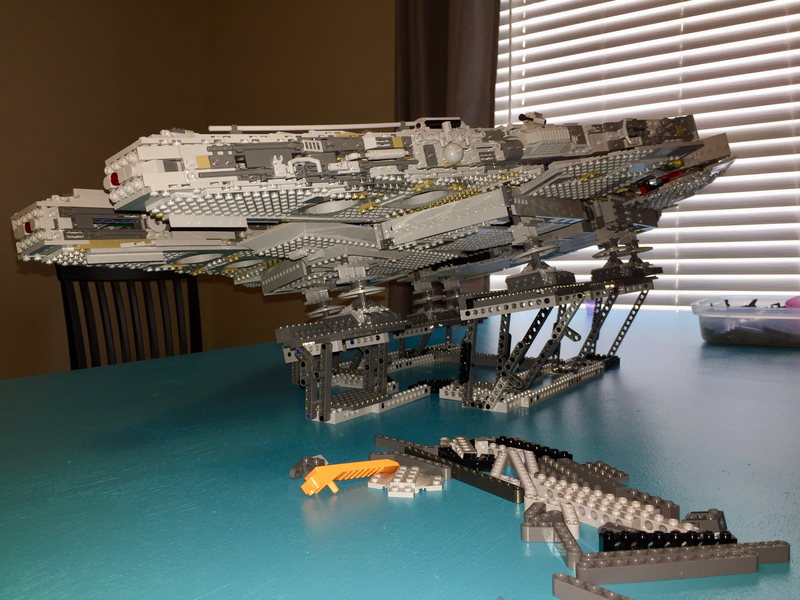 I was curious to see if I could even get something to the angle I wanted, but I am concerned about the structural strength of the landing gear, and after looking at it a bit more I may be rethinking the concept here. It think I'm likely going to have to directly attach to the inner technic frame, and eschew the "include the landing gear" concept I was trying to adhere to. 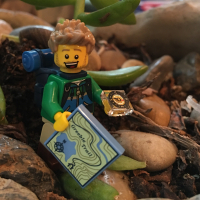 Would love any pictures you want to share! The company that built the display case have used the image for their website custom lit case displays..